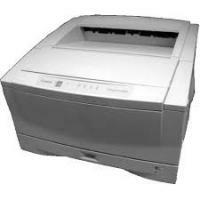 The Canon FP-400 is an all-in-one laser printer that has professional looking output and a good output quality. It is designed in such a way so that it can work with Canon’s microfilm scanners. The Canon FP-400 is basically used at professional places and the printer can be operated with a very few controls. It can be fitted into a small place due to its small size. Connectivity of this printer through PC is mainly through a USB port. It is a very economical printer. Its initial cost is neither too high nor too low. The yield of Canon FP-400 Toner Cartridges is 10,000 pages which is quite high. It has a good scanning speed and can scan up to 400 x 400 dpi. This printer has a good printing speed and can print at the rate of 9 pages per minute. It supports letter, legal and ledger size of pages. The Canon FP-400 can print directly from a network or through a PC. It can also be used as a digital micro printer system when it is connected to a microfilm scanner. It can print a large volume at a time due to its high paper handling capacity. The Canon FP-400 is a laser printer that is best suited to meet the needs of offices that require professional printers. This device has a small footprint but has a good print quality and a high printing speed. Replacement Canon FP-400 Toner Cartridges have a quite high price and are difficult to install. But the printer is not that costly at the time of purchasing. As it has a high paper handling capacity, it can do printing in a large volume. But connectivity of this printer to PC through a USB port. It it is a heavy device but on the other hand is quite compact in size. Q. What is the shelf life of Canon FP-400 Toner Cartridges? A. A toner cartridge that is stored intact with the original package offers a shelf life of approximately 2.5 years. If the cartridge is stored open without its package, its shelf life comes down to 6 months. Q. What is the maximum page yield of Canon FP-400 Toner Cartridges? A. The compatible Canon FP-400 Toner Cartridge offers printing up to 11,000 pages. Q. What are your delivery charges for the compatible Canon FP-400 Toner Cartridges being purchased from your site? A. Our delivery charge for any order starts from €1.99 inc. VAT. If ordering Paper for example the delivery charge will be higher according to weight.Any further delivery attempt will incur an additional charge of €4.95 inc VAT. For more details you can visit https://printerinkcartridges.ie/delivery. Q. Which brand’s compatible cartridges are available on your site? A. We stock compatible printer ink covering all the leading brands such as HP, Epson, Samsung, Brother, Advent, Canon, Kodak, Lexmark, OKI and many more. Q. In how many days the order will be delivered? A. Usually it takes around 1-2 days on all our products if you order it before 12 noon on Monday to Friday. We don't deliver the products on Saturday’s and Sunday’s. If the order is urgent then please contact by telephone on 048 30833221 or email us on info@printerinkcartridges.ie. Q. I have ordered the incorrect compatible cartridge from your site. How can I return it? A. In case you have ordered the incorrect item, please contact us within 30 days of purchase as detailed above. All non-faulty items must be returned unused, in their original undamaged packaging and in a re-saleable condition. We'll exchange the item or give you a refund by placing a credit on your account. Please note, all such returns are subject to a 10% restocking charge. Q. What about the security of my personal details. Are my details safe with you? A. The customer’s personal or payment information is completely safe with us. All the sensitive information asked for is taken in accordance to provide you with the best possible service; product delivery and customer service. We assure you that the information you provide will only be utilized by us and under any condition, we will not sell your information to any third party. Q. I recently realized that I have placed an order for the wrong cartridges. Now I want to cancel my current order and want to place a new order for another product. How can I do this? A. If you want to cancel the order made, please do it as soon as possible by contacting our customer support service center. If in any case the order has already been dispatched we will try to make arrangements to cancel the shipping or if the ordered has been delivered, you can refuse to sign at the time of delivery. After the cancellation of your order is confirmed, we’ll place a refund back into your account and you can place a fresh new order for any other product on our website. Q. What precautions should I follow to store the Canon FP-400 Toner Cartridges properly? A. It is always suggested to follow the proper precautions while dealing with the printer or its consumables. The first thing to keep in mind is storing the Canon toner cartridges in their original packaging until you are ready to use it. Store the cartridges away from any direct exposure to sunlight. Q. Does improper storage of Canon FP-400 Toner Cartridges reduce its shelf life? A. Yes, the cartridge would definitely lose its shelf life if not stored correctly. A toner cartridge that is stored intact with the original package offers a shelf life of approximately 2.5 years. And if the cartridge is stored open without its package, its shelf life comes down to 6 months. Q. Are compatible Canon FP-400 Toner Cartridges easy to install or would it require some additional steps as they are recycled and not genuine? A. Installing the compatible toner cartridges is easy and you shouldn’t find any difficulty while installing them. Please follow the simple installation steps available in the user manual.